Home » Blog » WTF, Taris? A few days ago I finally managed to get my Sith Marauder to Taris. I had some trouble at first getting oriented at the landing site, but nothing really to post about. A few initial quests yielded me some decent amounts of crystals to artifice and things looked good. Until I arrived at the “Border Assault Post”. Damn, I’ve seen that place before. It looks just like one of the Republic outpost on Taris. And as it turns out, the whole map is identical to the Republic map. Which shouldn’t be much of a surprise, since it’s the same world and both sides are competing for this world. However, all the quest hubs are now in use by Imperials instead of the Republic and there are different mobs throughout the area. No pirates, like on the Republic side, and the Cathar and the Taris Militia are exclusive to the Empire map. I just got quests leading me into the starship Endar Spire, but I fear the story which presents itself there will be very different from the Republic one. Just like the other quests throughout Taris. It’s not just a different point of view, the events in the stories differ. Which annoys me to no end. I’ve seen a few story elements within class quests which just didn’t fit together with other class quests. Most obvious to me is the complete absence of the Twi’lek matriarch of the Consular line within the Jedi Knight quest line. Or the differences around Nem’ro the Hutt between the Imperial Agent and the Bounty Hunter quests. 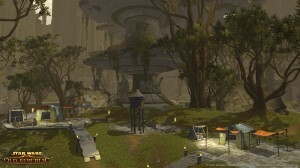 Nemro’s located on the left side of his palace for IA’s and on the right side for Bounty Hunters. He’s got lieutenants for the IA where there’s just a single accountant around for BH. This really makes me wonder, if I should head over to some SWTOR role playing sites and check out hat they have to say about the poor development of lore. In the end, it’s just another piece of the puzzle that is Bioware. I keep noticing issues where I keep thinking that they went designing the game all by themselves as a company who makes single user games, without much consultation of experts from the MMO world. They could have learned a thing or two. And somewhere down the road, when they finally notice the errors of their ways, they will have to create some very clumsy stories and explanations to make the lore between the classes and the factions consistent.